The future of China in transport is not through more cars. Photo by Ol.v!er [H2vPk]. Our China Transportation Briefing shares interesting news and noteworthy research related to China’s transportation and urban development. The goal is to help people who are interested in solving China’s urbanization and transportation problems understand relevant Chinese policies and trends. Each issue revolves around a particular theme, with content summarized from recent newsletters and magazines. If you have any questions, feel free to contact Research Analyst Heshuang Zeng at hzeng@wri.org. With new leadership in Beijing in 2013, Chinese people may express their need for change to their government, including the need for better urban transport. For cities in China, 2013 will be another year of rapid change, coming with great challenges and opportunities to improve the quality of urban life. The country’s investment-driven economy will keep urban development and public transport infrastructure – think metro and bus rapid transit (BRT) – growing, but still more and more Chinese will buy a car. The challenges of traffic congestion and air pollution from automobiles, already affecting large cities like Beijing, will now confront more second-tier cities. 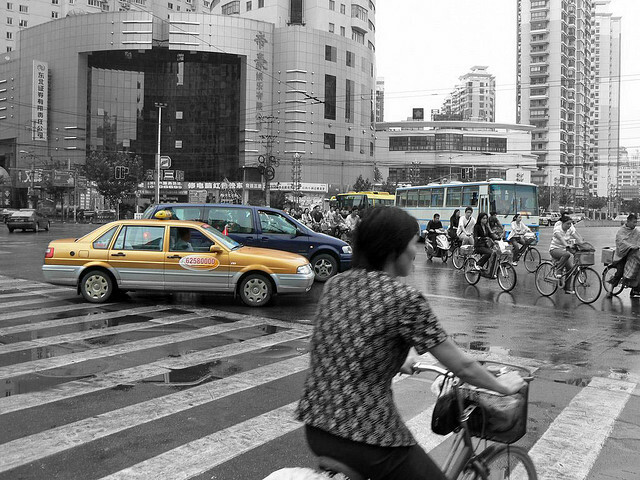 Could Chinese cities develop more sustainable mobilities? In today’s and tomorrow’s blog we will be look at five trends affecting urban transportation in China: the expansion of urban rail, the fight against air pollution, the automobile ban, a biking renaissance, and multi-modal integration. On December 30th, 2012, Beijing opened new 70 kilometers of metro lines, surpassing London and becoming – at 442 kilometers – the city with the world’s largest metro system. In 2012 again, three Chinese cities – Hangzhou, Suzhou and Kunming opened their long-awaited metro lines, bringing the total of Chinese cities with a metro to 18. China’s urban railway will continue to undergo fast expansion in 2013. In China, urban rail systems are widely regarded as a benchmark for a modern, livable city – cities are craving metros to meet this “new normal”. The central government issues strict criteria, only allowing large (population over three million) and wealthy cities (GDP over 100 billion yuan, or $16 bn) to build metros, yet many cities are set to meet these baseline criteria and more urban railways will be seen in Chinese cities. In September 2012, the National Development and Reform Commission (NDRC) approved subway and light rail lines in 23 cities. This was the largest number of projects ever approved at one time by the NDRC, for a total investment amount in excess of 800 billion yuan, or $128 billion. As of today, over 30 cities have urban rail systems under construction. China plans to add 2,500 kilometers of metro lines during the current 5-year plan (2010-2015), where the total length of metros in operation in 2010 in the country was only 1,471 km. The ambitious metro expansion plan brings great challenges to finance. For some cities, metro expansion will be at the expense of development of rest of public transport system. For it is not only costly in construction but also in operation. Currently, most cities maintain very low ticket rate due to the price control of the central government, e.g. Beijing subsidized 3.69 billion yuan (US$500 million dollars) on its metro operation in 2012 . And the local governments which is in charge of urban transport development receive half their funding from land sales and from borrowing money. As highlighted in a recent McKinsey’s prediction, this is unsustainable and Chinese cities will start to go bankrupt in 2013. However, change may come soon. The State Council’s recently announced policy to allow the capture of the increase in land value around public transportation stations to finance transport development. This new policy may open the doors to new urban rail finance for Chinese cities. They can find inspiration in the Rail + Property Model in Hong Kong. Once again in 2013 Chinese cities will be battling with air pollution. China’s air quality crisis is now nation-wide. On the second week of January, dense smog shrouded Beijing, Shanghai and other cities in China, making headlines around the world and creating serious health concerns. On January 13th, Beijing’s reading of PM2.5 (particular with the diameter of less than 2.5 microns) reached nearly 1,000 micrograms per cubic meter, about 40 times the level recommended by the World Health Organization. According to a recent report by Greenpeace, high levels of PM2.5 is predicted to have caused over 8,000 premature deaths in four cities across China in the year 2010. Admittedly, China has made efforts towards more transparency in air quality public data over the past year. In January 2012, Beijing began releasing its own air quality data. In March, 2012, the Ministry of Environmental Protection revised the air quality standard to include PM2.5 particles along with other pollutants. This year, the national government is making even bigger strides to improve air quality transparency: beginning this month, real-time air quality monitoring data on PM2.5 intensity in China’s 74 major cities will be made available by China’s National Environmental Monitoring Center. The Ministry of Environment Protection (MEP) also announced it will reduce the intensity of PM 2.5 by 5 percent by 2015 (compared to 2010 levels) across thirteen major urban areas covering 14 percent of the country and 71 percent of the nation’s GDP. At the local level, cities are making great efforts to relieve emissions. Beijing will take some official vehicles off the road on extremely polluted. And Lanzhou, one of the most polluted cities in the world, is considering an even-odd license plate travel policy to help minimize air pollution. Battling with air pollution will be a long term effort, on a road often portrayed as oscillating between economic development (related to coal fired plants and the automobiles) and environmental protection. Currently, the air pollution issue seems to over shadow other pressing issues like corruption. As vehicle emissions are often the second largest contributor to air pollution in most Chinese cities, the increasing demands of the rising middle class for clean air are likely to drive the government to take more radical actions on cars. As the world’s largest automobile market, China will continue to regress towards ever more cars, while more cities might operate car restrictions in response to congestion and air pollution. Recent forecasts show that 2013 car sales will be up 8%, slower than the growth rate in recent years. Although China will continue driving one third of the global growth in the automobile market, the trend is more than likely to change with the increase of car restrictions in cities. Last July, Guangzhou rolled out a vehicle license quota, modeled after Shanghai, Beijing, and Guiyang. With Guangzhou, the three largest cities in China limit vehicle purchases to stem the tide of private auto ownership. This type of restriction is rarely found worldwide – with Singapore a notable exception. These restriction policies may indicate a tipping point in sight for China’s rate of motorization. Meanwhile, many other cities have already limited vehicles driving on the roads using travel restrictions based on vehicle license plate numbers. As of today these restrictions are in place in 7 cities – Beijing, Changchun, Chengdu, Guiyang, Hangzhou, Lanzhou, and Nanchang – where none existed in 2007. Restricting automobiles at the early stages of motorization may lead to a different pathway of urban development and mobility. Along with the continuous improvement of public transit, Chinese cities might simply be able to “leap frog” to a more sustainable urban paradigm. This blog post is part of a 2-day series. Check back tomorrow for Part Two – a biking renaissance and multi-modal integration. The Trillion Yuan Question: How Can China Fund Its Sustainable Growth? China Transportation Briefing: How to Save China’s Capital?